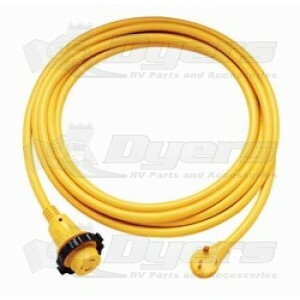 Power Cord Plus® Features Power Indicator Light Coach side connector features a molded-in LED light: When it glows red, you know you have power to the RV. Comfort Grip: Connector end is molded to fit the contour of your hand. Thumbprint Locator: When the thumbprint is in the 12 o’clock position the blades line up for easy connection. Connects 30 Amp coaches to park power. Easy lock system with threaded ring and easy lock ring ensures easier, more secure connection. LED power indicator light lets you know when the connection is tight. The product I ordered arrived quickly after ordering and I was able to have it for use immediately. It was exactly what I needed. Thanks for the help!